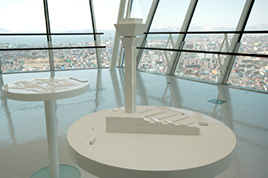 The observation deck offers spectacular views of the national historic site Goryokaku. There is also an exhibition space called Goryokaku Historic Corridor where visitors can learn about the history of Goryokaku. 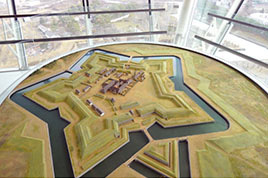 The model is an accurate representation of Goryokaku when it was first built. 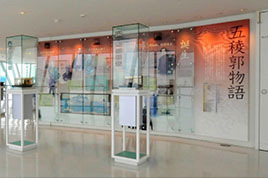 You can compare the current and the previous looks. 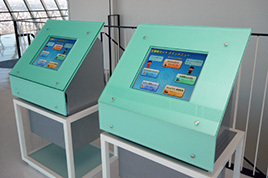 A chronological table and graphic panels are used to introduce the history of Goryokaku, which began when Perry’s fleet arrived, in a manner that is easy to understand. 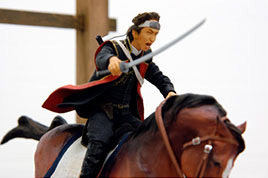 The Memorial Pole with 16 dioramas presents the stormy history of Goryokaku and the people’s drama. 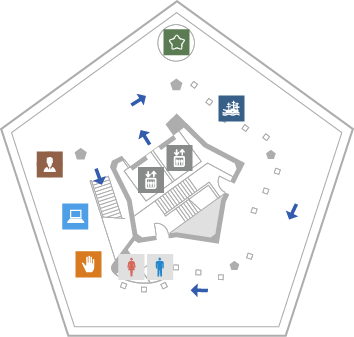 Even visitors with visual impairments can directly touch the beautiful star shape and unique design of Goryokaku. 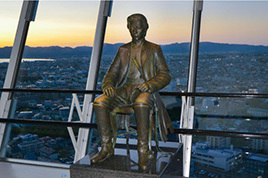 Based on a well-known picture of Toshizo Hijikata wearing a frock coat and boots with a sword at the hip and sitting on a chair, sculptor Machiko Kodera spent two years in the making of this bronze statue. We have brochures that describe the history of Goryokaku and sixteen dioramas inside the Goryokaku Historic Corridor. Please feel free to take one. There are two types of memorial stamps. *Please feel free to ask our staff if you need assistance. We will take you to a desired floor by elevator. *Please note that once you exit the observation deck, you cannot re-enter the observation deck.